The greatest legends of golf compete this week at the Bass Pro Shops Legends of Golf at Big Cedar Lodge in Ridgedale, Mo., in the only PGA Tour or Champions Tour event hosted at a Par-3 course. 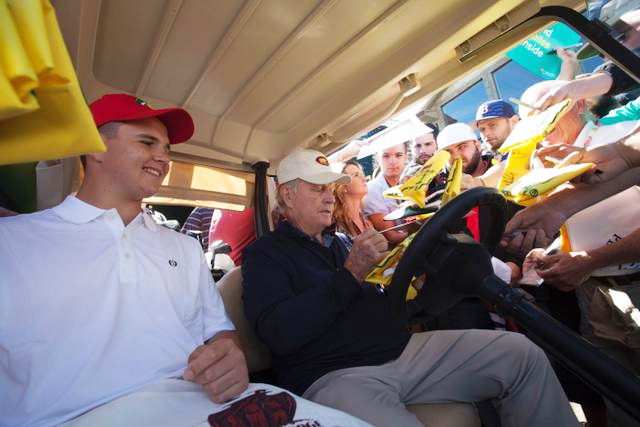 The chance to see Jack Nicklaus and Gary Player tee it up on the Golden Bear’s acclaimed Top of The Rock design has drawn around 25,000 spectators in each of the last two years, and officials expect attendance to rise in 2016 with spectacular weather forecasted. The “Legends,” players 65 and older, will compete at Jack Nicklaus-designed Top of the Rock, while PGA TOUR Champions will split their time between Top of the Rock and Buffalo Ridge. Both divisions will play all three days of the tournament (Friday through Sunday). The PGA TOUR Champions made the decision to have the Legends division play all three rounds on the Nicklaus-designed Par 3 course, and it is a move the field, including the Golden Bear, embraced. The tournament airs Friday from 11:30 a.m. to 2:00 p.m. ET on Golf Channel. Saturday coverage is from 2:30 to 5:30 p.m. on Golf Channel. The final round airs Sunday from 3:00 to 6:00 p.m. ET. on Golf Channel. Joining Nicklaus and Player this year in the Legends Division are three-time major champion Hale Irwin and eight-time major champion Tom Watson. Together, the group has won 38 major championships on the PGA TOUR and has 32 major victories on the PGA TOUR Champions. Nicklaus is the only player in history to have completed the career Grand Slam on both the regular and senior tours. The Legends Division will play Holes 1 through 9, with Modified Alternate Shot and play Four-Ball format for Holes 10 through 18. Sunday they will play Four-Ball on Holes 1 through 9. In a Modified Alternate Shot format, both players make strokes from the teeing ground, choose a ball, and play alternate strokes with that ball until it is holed. The player whose ball was not chosen must play the second stroke. The ball that is chosen must be played until holed unless the provisions of another rule apply. Last year, the team of Jack Nicklaus and Gary Player made a charge Sunday, but came up a bit short as they finished runner-up to the “young” guns of Bruce Fleisher and Larry Nelson in the Legends Division. Nicklaus and Player entered the day four shots back of the tandem of Fleisher and Nelson. The Golden Bear and Black Knight colored their scorecards red Sunday on Nicklaus-designed Top of the Rock with a birdie on No. 4 and a Nicklaus birdie on No. 7, cutting the margin to two with two holes to play. But they missed a birdie on the final hole, and Fleisher birdied for a 12-under finish and three-shot win. The par-3 Top of the Rock golf course offers a one-of-a-kind golf experience. The natural Ozarks topography and breathtaking views of Table Rock Lake make the Jack Nicklaus Signature Golf Course unlike any other. In 2015, Golf Advisor named Top of the Rock to its list of the Best 10 Par-3 Golf Courses in the U.S. Participants and fans can also rub elbows with many other high-profile celebrities including legends from the worlds of fishing, racing and entertainment. Daily Pass tickets are available from $20. Visit bassprolegends.com to learn more.